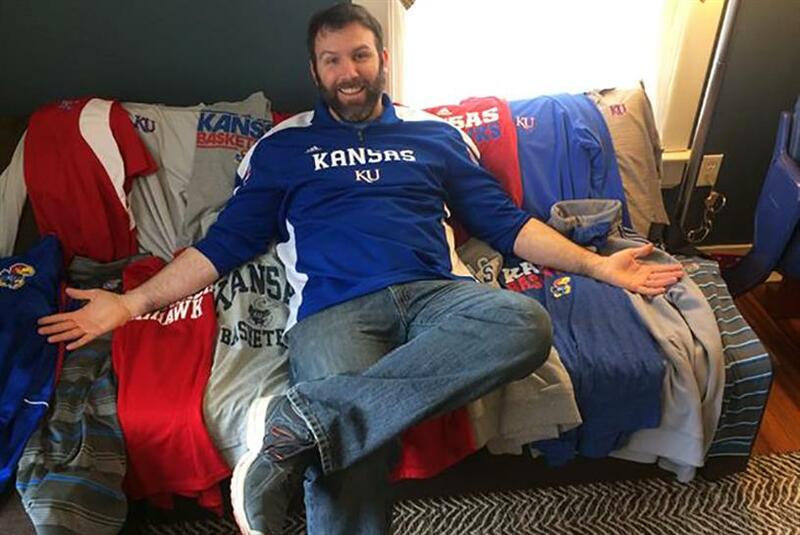 March Madness is more than a basketball tournament to this Kansas fan. It's a way of life. When Michael Coggins first stepped foot on a college campus, he was 8. The University of Kansas Jayhawks had just won the NCAA men's basketball national championship, and his parents took him to celebrate with fellow fans. "That amount of pure, exultant joy can have a profound effect" on you, Coggins said. Not that he had much choice. His parents are both Jayhawks. "I was born into it. In my family, it's just simply a way of life. It's who we are," he said. We couldn't think of a better superfan to honor on the first day of March Madness, than a college basketball diehard. How do you show your love for the KU Jayhawks every day? I split season tickets with my mother and attend nearly every home game. In my home office, I have one piece of the old flooring from Allen Fieldhouse with my name etched into it, an antique pennant with the old KU design, two bricks from the original construction of our venerable temple (Allen Fieldhouse) that were replaced during an addition, four more small pieces of the floor, one section from the '70s that is over 7 feet tall and 3 feet wide, a framed reprinted program of a KU rivalry game from 1914 and two chairs that used to be in Allen Fieldhouse. That is just what I can physically see from my desk. I have a KU flag on my front porch; I have traveled to numerous cities to watch them play. And I start every day by reading updates on various blogs to ensure I have a finger on the pulse of KU basketball. How do you spread the KU Jayhawks love? I usually take a picture of my mom and me attending games. Last Christmas, I had them bound into a photo book with the dates and scores listed along with all of the pages. To this day, my sister's favorite birthday present she's ever received is when I convinced forward Jamari Traylor and a few other Jayhawks to send her a video wishing her a happy birthday. What's your coolest piece of Jayhawks swag? When KU beat our biggest rival in what might have been the last time we play in Lawrence, we did so under unfathomable circumstances. I sat next to my mom, and at the end of overtime, KU having just won with such an amazing comeback, I said, "If was 100 years old, I would try to die right now." We took one more picture, screaming into the camera with exhaustion and joy. I made a frame for that picture out of (you might be noticing a theme here) a small piece of old flooring that used to be part of James Naismith Court. That picture is in my parents' kitchen and is probably my favorite piece of Jayhawk memorabilia. What's the craziest thing you've done for the Jayhawks men's basketball team? Upon hearing I had an opportunity for tickets to the 2003 Final Four, I convinced three friends to take off at 1 a.m. and drive straight to New Orleans. At the 2008 Final Four, a friend realized we were playing better when he was sitting down, so during another amazing and improbable comeback, we didn't let him stand. In 2012, we were playing Ohio State in the Final Four and sadly, I wasn't there in person to watch. But, when the game ended, I ran from the bar where I was watching, only to sprint back seconds later, turn my chair upside down and carve an M into the underside of it, so that I could ensure I would be able to sit in it two days later for the championship. I then proceeded to sprint into the streets and celebrate like a crazy person. What's the nicest thing the Jayhawks have ever done for you? In my adult kickball league a few years ago, we did get one of my favorite all time Jayhawks, Jamari Traylor, to come out and throw the ceremonial first pitch. It was silly but great. If you could change one thing about KU men's basketball, what would it be? Every fan wants more championships. But if I had to choose, the change would be something out of their control. I would change the early entrance rules for the NBA to make them more like college baseball. I'd change the "one and done" rule, which allows college players to enter the NBA draft after one year of playing in the NCAA. What's the one thing that would make you disloyal to the KU Jayhawks? I'm a big Costco shopper. I feel personally responsible for the meteoric rise in Apple's stock price since the release of the first iPhone, and I really like Odell Brewing Company.